And how many of them meet the latest Euro 6 standards? CG – not quite, because these charges only apply to a limited number of vehicles. Strange about black cabs being exempt – didn’t Gummer and/or his mate Yeo have something to do with an electric powered black cab company the cabs being built in China. The other question is what did the Kings and Imperial College study actually study – car exhaust emissions or air quality, the two are not the same. The first should be looking at the combustion residue while the latter should be looking at the particles from brake pads, tyre scuffing and other particulate matter that is much more likely to promote and/or aggravate asthma. Total load of twaddle. 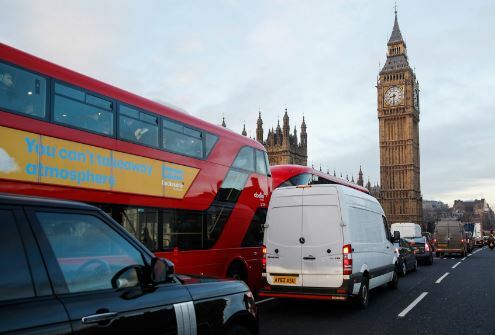 London’s air now has a third of pollution levels compared with 1970. So all these increasing problems are caused by reductions in pollution are they? Junk science that ignores the huge reductions in pollution. Road dust is a factor, as ivan said. A big bang policy of getting rid of older black cabs all at once would put a lot of cabbies out of work – not politically feasible for a London mayor. Replacement cabs have to meet the new electric-oriented standards. Particulate pollution was also found to be generally higher on London's Tube system compared to other subway systems. Researchers said this was "likely due to the system's age and the fact that large parts of the network are in deep, poorly ventilated tunnels". The Tube is the world's oldest underground railway network. The solution seems straight forward to me. Add 2% H & O to the air intake and remap the computer to ignore the high O2 level and move injection timing close to TDC. Sooty particulates decrease close to zero. CO disappears completely, some diesel trucks use 25% less diesel but the various NOs tend to go up. This could be filtered perhaps. The H & O method means car manufacturers can do away with Exhaust Gas Recirculation pipes which on my Transit, blocked up early in its life. The fuel savings repay set-up costs inside two years for most commercial vehicles so businesses could be encouraged to do this through existing income tax rebates without more of these silly “top-down” dictats. Not sure how you control the dics that create these rules tho’. Here in Australia a Perth Uni lecturer designed a good system over a decade ago. (Marketed as Hydrogen Fuel Systems) These systems are not popular in Au as diesel is only 80p/lit and air pollution is only a problem in Melbourne, Sydney and Brisbane on a small number of days per year. I spent 6 weeks in UK in mid-1997 and again in mid-2018. The air quality in the cities seemed pleasantly better than I remembered tho’ the general run-down greyness of the entire country was evident. Without any data I’d say that generally everyone is more environmentally aware these days and the place has cleaner air and water-ways.